Getting engaged and married are big events! We've got some marriage proposal ideas, advice and tips you will need to make this time as special as possible for the both of you. Choosing the perfect diamond engagement ring is only the beginning, deciding how to make the event extra special is just as important. Make it unforgettable! Your engagement needs to be special, not just for your special someone, but for you as well. For a romantic touch, you may want to pick a memorable place you've shared together. Whatever you do, remember that you will be telling your proposal story to friends and family for the rest of your lives. You'll want to make it a great one! Cook her a romantic dinner for two. 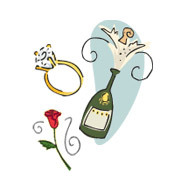 Tie the engagement ring using ribbon to the stem of a glass of champagne or sparkling cider. Take her out for dinner at your favorite restaurant and arrange with the waiter to display the ring in a box as one of the choices on the dessert tray, or write "Will you marry me?" in chocolate sauce on the rim of her dessert plate. Rent a limousine. Propose to her in the limo on the way to or from your special evening. Be sure to bring champagne or sparkling cider to celebrate. Rent your favorite romantic movie. Make it special with homemade popcorn and her favorite movie treat. Tell her you want your own happy ending by proposing as the credits roll at the end. Give her three roses: Tell her one represents the past, one represents the present and the last one (with the ring tied to it) represents the future. Turn out all the lights in your apartment or home. Make a trail with candle lights leading her to the diamond engagement ring. If you enjoy sailing, go for a sunset sail and propose at sea. Remember to bring some food and champagne and wine glasses for a toast. Is she a traditional gal? Start by asking her father for her hand in marriage. Then arrange for a family dinner. Propose in private and make your announcement to the table. No proposal is complete without the perfect diamond engagement ring. Browse our selection of affordable, quality diamond engagement rings to make your proposal even more special.